As suspected, the updates are mostly cosmetic, with an updated front bumper, rear bumper/diffuser, spoiler, and interior RS trim color options. 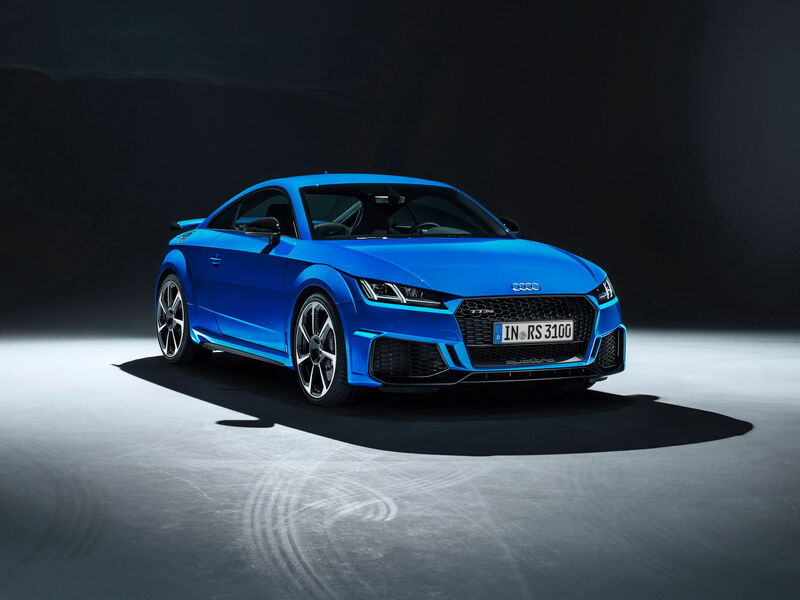 Personally I was hoping for some more standard updates to set it apart from the other TT models, such as the OLED tail lights, but those appear to still be optional extras. I've you've been scouring the internet for 2019 TT RS photos like I have, nothing here is new, but at least the available photos are high quality now. Last edited by Sam2; 02-05-2019 at 07:38 PM. There are new optional "matrix LED" headlights, apart from the standard LED headlights. No mention of carbon ceramic brakes, just the steels, but they do mention OLEDs, so maybe the Dynamics package has changed. Blue RS interior bits are available. Honeycomb seat stitching is a thing. 12 o'clock mark on the wheel. No word on Audi Exclusive colors - fingers crossed. RS Sport Suspension Plus (adaptive dampers) is stated as an option, but my guess is it'll be the standard for the US market just like the previous years. Tire pressure monitors may be standard? Again, this might be a market discrepancy. According to my dealer, the 2019 TT RS ordering guide dropped today. My SA doesn't know what's going on and said he was going to look into it today. Nothing back yet. Before you get too excited, you are looking at the Euro version. No one knows what the USA will get. There are items on the base TT and TTS Euro 2019 refresh that the US will not get, like the new grill. Until Audi of America gives us anything, it's all we've got to go off of. Differences between the Euro and North American version of the 2018 RS were down to bundled package differences and maybe a different interior color? Can't remember exactly, but it wasn't much. The changes to the 2019 are very minimal overall, so I can't see it being much different over here in regards to the updates. Thanks for sending that, McTTRS. Cool to see OLED tails as a separate option now, and rear-view camera and TPMS as standard. I'm trying to remember if the 2018 TT RS order guide also didn't explicitly list Exclusive Colors as an option in the table. The fact your dealer sent the PDF with the Exclusive Color choices is a good sign though I suppose. One difference that I noted that is really cool is that black badges and rings are now included with the black optic option.